Custom hangars are not working on clients installed in the launcher setting "compatibility mode". With the introduction of update 1.59 “Flaming Arrows”, players are able to change the hangar for a custom one. It is not too difficult to do. First you need to create the location You can create it yourself or use a custom location created by someone else. The location file has an extension .bin. The appropriate location is situated in the game directory, you need to add it to the game root directory attached to the myhangar.blk file or create it yourself. An example of a user based hangar on the port location hangar "Port of Novorossiysk"
level:t = "levels/*location_file_name*.bin" - path to the location designated as the hangar in the game directory. modelRotation:r = 60 - direction of the player vehicles in the location. modelPos:p3 = 2154, 17.7, -684.4 - vehicle placement in the location. When adding, the above parameter is responsible for the position of ground vehicles in the hangar. If different types of vehicles are given different locations, switching between them in the hangar will initiate a smooth change of camera view. Have you completed your hangar? 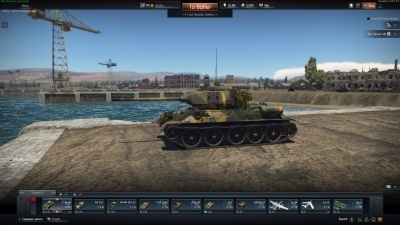 Don’t forget to share your creation with other players on Live.warthunder.com in the section “Locations”. If you are the author of your own hangar, your installation will be completed already when referring to the "how to create a custom hangar" instructions. When downloading a custom location from “Live.warthunder.com” for example, you need to correctly add the location of the hangar and set the path to the appropriate files. Download the new hangar location file. The file must have an extension of .bin. Add the file to a created folder in the game directory. In the root directory place the configuration file myhangar.blk and set it up with a direct parameter to the location file .bin with vehicles. Follow the instructions "how to create a custom hangar". The next time you run the game, you will log in to the new hangar. Remember! Custom hangars are used entirely at your own risk - they may function incorrectly, or cause errors in the game client. This page was last edited on 1 September 2018, at 12:58.